After its world premiere at the New York City Horror Film Festival, writer/director McKegg Collins' Eros Point picked up a couple of prizes at the Queen Palm International Film Festival including a Bronze Award for Best Poster and a Silver Award for Best Original Song. The 11-minute indie short stars Clay von Carlowitz and Asta Paredes as a couple who return to their remote getaway grapping with the ending of their relationship. While this may not sound like it has the makings of an indie horror short, Collins takes Eros Point in some unique directions over the course of its 11-minute running time and it becomes obvious early on that we're not just dealing with some broken romance. Lloyd Kevin Hembrador's lensing gives the film a soft intimacy that you don't always expect in this kind of film, but it fits perfectly with a story that unfolds differently than you might expect. 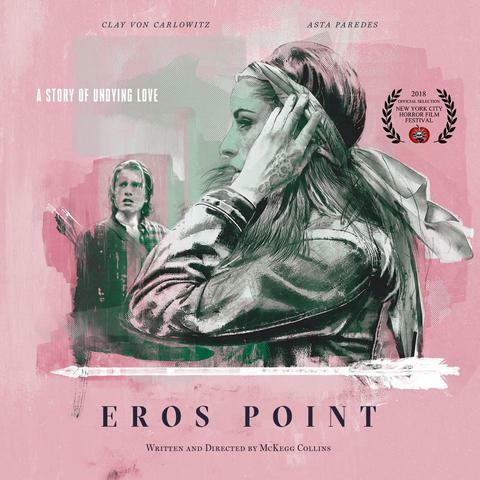 Eros Point is hindered by the usual low-budget indie obstacles, most notably special effects that never quite convince and an uneven sound mix that impacts the film's dramatic impact. However, fans of indie shorts aren't likely to be bothered by these concerns as the film's interesting story and involving cast help largely help to overcome these obstacles. Eros Point is continuing on its indie fest run. For more information on the film, visit its Facebook page linked to in the credits.